Tehran, Feb 11, IRNA - Commander of the Islamic Revolution Guards Corps (IRGC) Major General Yahya Rahim Safavi said here Saturday Iran has started mass producing and using a stealth drone with a range of 700 kilometers. In an interview with Iranian Arabic news network "al-Alam" the general said the drone can be used in reconnaissance operations, information gathering, picture dispatching and film shooting. He added the shape and material of the drone makes it impossible to be detected by radars so it cannot be targeted. General Safavi said, "The drone has passed its experimental phase and is being mass produced, and we are currently using it in our operations." 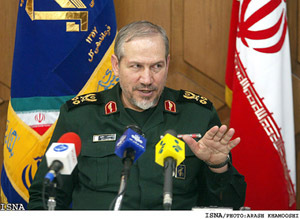 Responding to a question about a big military exercise to be launched by Iran soon and if it is probably related to threats from outside the region, General Safavi answered, "Military exercises are something normal for all, and Arab countries of the Persian Gulf region had a large military maneuver in the Oman Sea and we also have military exercises in our annual programs and we test our domestic made weapons in the exercises." He added threats are usually made by some foreign media and they have a nature of psychological war, but he underlined that Iran's armed forces, completely aware of enemies' military movements, have prepared their defensive plans to confront decisively any possible threats. After 28 years of Islamic revolution victory, especially with 8- year experiences of the imposed war, defense ministry and armed forces have reached self-sufficiency in production of different types of weaponry from ground to ground missiles to long range missiles, ballistic missiles with the range of 2000 kilometers and coast to sea missiles. Commander of IRGC said Iran's strategy is completely defensive adding," we want peace, tranquility, security and progress in the Persian Gulf region. "We do not intend to invade countries and we do not believe in expansionism, rather, we are to protect our revolution, develop our country and remove our problems," the general added.